First and foremost, reinforce to U.S. allies in Asia that America’s commitment to both regional stability and to their defense will be bedrock principles of the incoming Administration. Second, establish a national security directive on day one that brings coherence to how the United States views its relationship with a rising China. The primary objective should be to articulate explicitly that U.S. policy will be dictated by its core interests in the region and not by existential arguments over whether China is inherently a friend, competitor, or adversary. Third, eliminate any ambiguity over the U.S. role in safeguarding freedom of navigation in Asian waters by declaring without reservation that the United States will not recognize or abide by any exclusionary zone or ADIZ [Air Defense Identification Zone] declared in or over international waters. To reinforce the seriousness of this policy, particularly to China, the Pacific Fleet should routinely sail within 12 miles of every piece of rock in the South China Sea that has a foreign flag affixed to it. Fourth, develop a comprehensive cyber strategy that provides a framework for the new Administration to confront and hopefully discourage cyber-stealing and cyber-warfare. This would presumably include a system of near-automatic sanctions for firms or individuals found responsible for cyber-violations. 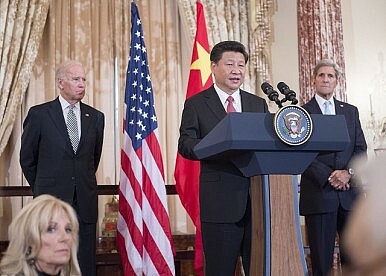 Lastly, the United States should make clear its desire to further integrate China and other Asian countries into current and aspiring U.S.-led institutions, including – eventually – the Trans-Pacific Partnership, if and when these countries prove themselves willing and able to meet the agreement’s high standards. What would be the impact of a U.S.-China bilateral investment treaty (BIT) on Asia’s economic landscape and the global economy? Unfortunately, and recent headlines aside, we’re quite unlikely to see any real progress towards a BIT in the next two years. A bad BIT is worse for the United States than no BIT, and there is little indication that we’ve reached the point where Beijing is ready to make the difficult revisions to its negative list that would make a BIT worthwhile. If you had to forecast China’s economic climate over the next year, describe three plausible scenarios – sunny, stormy and cloudy. Under all of these scenarios, China’s economy will continue to decelerate over time. The major difference will be in terms of how that slowdown is undertaken and, just as importantly, how competent Beijing is in communicating what is happening to world markets. The best-case scenario for China’s economy will be a year of continued slower growth, but with a strong emphasis on reform and restructuring. This entails: 1) empowering consumers by reversing the system’s reliance on financial repression, 2) introducing market risk, thereby allowing failing firms to go bankrupt and opaque shadow products to default, 3) combating overcapacity, and 4) turning away from an overwhelming dependence on non-productive, debt-fueled growth. The cloudy scenario is the above one implemented haphazardly, or communicated poorly. The stormy scenario, known as a “hard landing,” will happen if Beijing reverses course and refuses to restructure and reform. The world should hope that China does not opt for this third path. What salient geopolitical risks might exacerbate fault lines in China’s economy, and how should the next White House prepare in advance? Two dangers stand out in particular: First, a military conflict with neighbors – in the South China Sea, East China Sea, or over Taiwan. Second, a global devolution into currency wars – regardless of whether it is China or another nation that is ultimately to blame for it. To deal with the former, conflict can best be avoided by convincing Beijing that the United States and its allies are firmly committed to safeguarding international norms and that there will be serious repercussions for any aggressive actions in violation of them. The latter is trickier. There is no mechanism by which one country can stop another from devaluing its currency, and the threat of a domino effect therefore looms large. The best way to head off this situation is through close and high-level coordination amongst national economic policymakers, coupled by pledges to refrain from actions that will send events down this crippling path. But any such pledges are sure to be tested in the months and years ahead. How might U.S. presidential candidates – Democrats and Republicans – craft effective messaging on U.S.-China economic relations to the American public and U.S. allies? The first step is to actually establish a workable framework for U.S.-China policy, which is something that has been sorely missing for years now. At the heart of this problem has been a tendency to define the relationship in philosophical terms – Is China our friend or our foe? Should U.S. policy accommodate China or oppose it? But these are rather useless prisms through which to view a relationship where the U.S. and China’s economic ties remain largely mutually beneficial but their security interests are increasingly at loggerheads. Any constructive framework for managing U.S.-China relations needs to recognize and incorporate the reality of these two conflicting dynamics, and instead be guided by a single-minded adherence to policies that advance core U.S. objectives. The way to gain the support of the American public – and regain the trust of jittery U.S. allies – is to present a China policy that is coherent, consistent and most importantly, in dogged defense of their interests. Mercy A. Kuo is an advisory board member of CHINADebate and was previously director of the Southeast Asia Studies and Strategic Asia Programs at the National Bureau of Asian Research. Angie O. Tang is Senior Advisor of Asia Value Advisors, a leading venture philanthropy advisory firm based in Hong Kong.